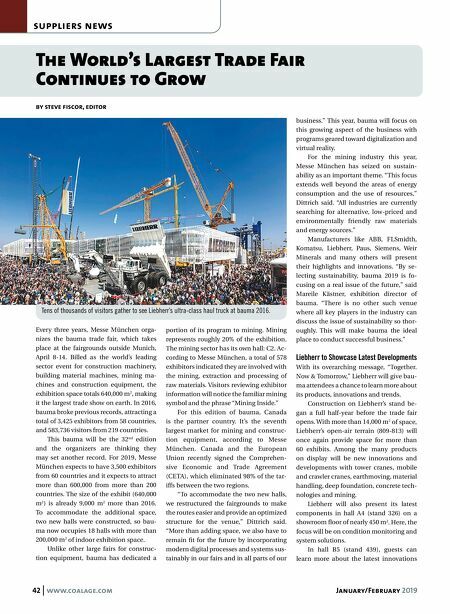 January/February 2019 www.coalage.com 43 suppliers news continued from Liebherr's extensive attachment tools program. For the new XPower large wheel load- er, trade visitors can also look forward to a total package with many smart assistance systems. Features also include the new rear-bystander detection and a built-in, sensor-powered tire-monitoring system. With these and other assistance systems, Liebherr offers total solutions to opti- mize safety and comfort during everyday wheel-loader operation. All these systems are developed by the Liebherr Group so they can be fully integrated into the con- trol systems of the machinery. In the mining area, visitors will have a chance to experience the power of ul- tra-class mining trucks and excavators. A single dashboard makes fleet manage- ment easier than ever. Wirtgen Presents Smart Synergies The Wirtgen Group is a global trendsetter when it comes to innovative road con- struction machinery — a fact highlighted by the company's approximately 120 ex- hibits and 13,000 m 2 of exhibition space at bauma 2019. This year, the group's slo- gan for the trade show is "Smart Synergies and Innovations." While the mining industry is most fa- miliar with Wirtgen and its surface miners, the Wirtgen Group also encompasses sev- eral specialized product brands, including Vögele, Hamm, Kleemann and Benning- hoven. Together, they form the basis for synergies that allow customers to leverage additional savings potential — in other words, Smart Synergies. The Wirtgen Group's concentrated strength will be on full display in Munich — together with John Deere at a shared booth for the very first time. Thanks to the two companies' complementary product rang- es, the lineup covers an enormous range of customer solutions. Visitors will not only be able to experience this for themselves up close at the exhibits, but also from a height of 5 meters during a tour across the Sky- walk, which connects each of the Wirtgen Group product brands' technology centers and John Deere to each other. Wirtgen will unveil the 220 SM/220 SMi surface miner, a new machine de- signed especially for use in small- and medium-sized mining operations. With a cutting width of 2.2 m and a cutting depth of up to 300 mm, the 220 SM/220 SMi can extract raw materials up to a uniaxial com- pressive strength of 50 MPa. Metso to Launch Groundbreaking Innovations Metso will introduce a number of new, state-of-the-art solutions for the aggre- gate, construction, and mining industries at bauma 2019. The launches include technologies and services that will im- prove productivity and drive down costs. Along with the new crushing and screening solutions, Metso will unveil a groundbreaking innovation for off-high- way trucks, enabling mines and quarries to haul more with less. This major product launch will expand Metso's offering into completely new territory and help cus- tomers reach a higher payload while low- ering their operating costs. Metso will also showcase a broad range of equipment, wear and spare parts as well as services designed to help make opera- tions more efficient and assets work harder. The solutions that will be featured include the Metso MX cone crusher, the company's line of optimized slurry pumps, the Po- ly-Cer wear lining and its financial services. Attendees can consult an up-to-date overview of exhibitors online in the bau- ma Exhibitor Directory. More informa- tion about the trade fair is available at www.bauma.de. 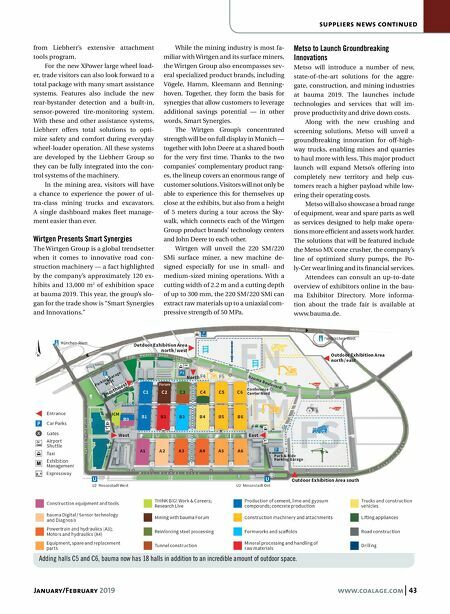 Adding halls C5 and C6, bauma now has 18 halls in addition to an incredible amount of outdoor space.